School district All Bexley Csd 2501 Fra Co. Columbus Csd 2503 Fra Co. Dublin Csd 2513 Fra Co. Gahanna Jefferson Csd 2506 Fra Co. Grandview Heights Csd 2504 Fra Co. Groveport Madison Lsd 2507 Fra Co. Hamilton Lsd 2505 Fra Co. Hilliard Csd 2510 Fra Co. New Albany Plain Lsd 2508 Fra Co. Reynoldsburg Csd 2509 Fra Co. South Western Csd 2511 Fra Co. Upper Arlington Csd 2512 Fra Co. Westerville Csd 2514 Fra Co. Whitehall Csd 2515 Fra Co. Worthington Csd 2516 Fra Co.
Columbus, Ohio, is quite the premier city: it’s the county seat of Franklin County, it’s the largest city in Ohio and it’s Ohio’s state capital. Plus, it’s the namesake of Christopher Columbus, the 15th-century explorer. News venues like BusinessWeek and Forbes ranked it as one of the best cities in the United States. Residents call Columbus “The Biggest Small Town in America,” which is an interesting oxymoron since it has over 850,000 citizens. This city is also unusual when it comes to passenger rail systems: it doesn’t have one. Residents don’t let this hinder them because they have other means of transportation such as buses, cars, airplanes, walking and biking. Speaking of biking, this city is a very bike-friendly area. It even has a bike-share program and two bridges reserved for cyclers and pedestrians. If you’re a bike fan, then you may have found the hometown of your dreams. Columbus is a major hotspot for science, history and the arts. The Center of Science and Industry is a museum that combines science and research. It has interactive exhibits, a planetarium, a theater and programs for kids, teens and adults. The science center even hosts weddings in its planetarium. Are you a sports fan? This city’s rampant with sports teams, especially the Ohio State Buckeyes of Ohio State University. The team plays football at the university’s Ohio Stadium, one of the largest football stadiums in the country. Other spectator sports you can watch include hockey, motorsports, soccer, basketball, baseball, rugby and lacrosse. 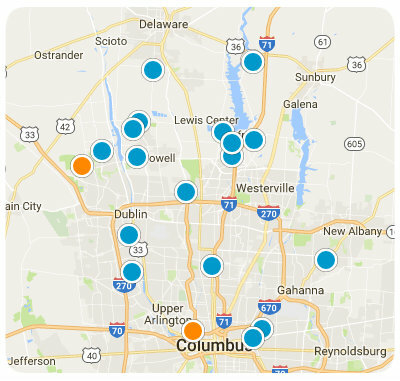 Columbus offers over 150 public schools for students in the kindergarten through eighth-grade levels. It also has many private schools. Besides Ohio State University, this city has one other public university and 17 private colleges. The real estate properties in Columbus are comprised of mobile homes, single family residences, and multi-family homes. Forty-four percent of Columbus homes were built during the mid/late 20th century and have an average of two to three bedrooms. Think about purchasing your new home in this grand city. It’s affordable, plus its transportation options make it easy to live without a car. Columbus has great weather during the majority of the year as well. If you’re searching for homes for sale in Columbus, Ohio, please contact us today. Courtesy of Frank B. Young, Inc. Listing Courtesy of : Lovetta B Beckman ---- Frank B. Young, Inc. Courtesy of Best Homes Real Estate Ltd. Listing Courtesy of : Caroline R Edralin ---- Best Homes Real Estate Ltd.